I was excited to find the farmer’s market overflowing with strawberries Saturday morning. I used my new Preserves Handbook (The River Cottage Preserves Handbook by Pam Corbin) to make this delicious and photogenic strawberry jam. 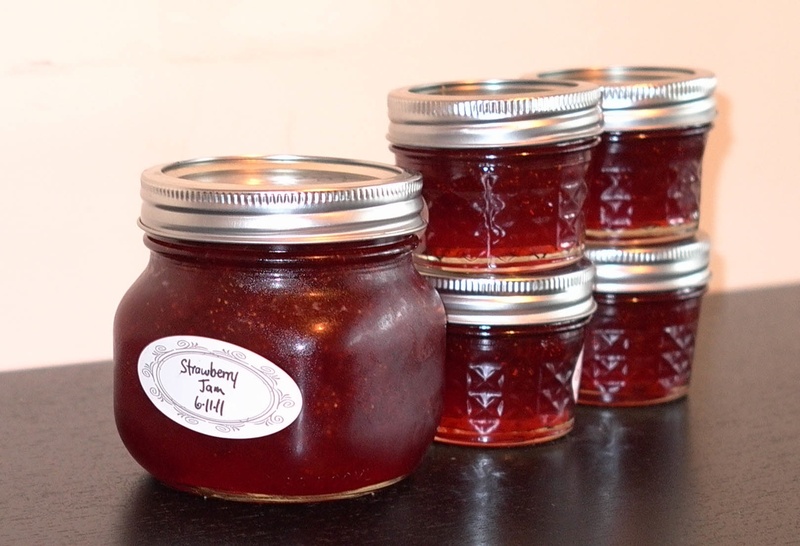 If you are going to can these, you’ll want to start sterilizing the jars before cooking the jam. That’s because you need to do a “hot fill,” meaning you need to fill the jars while the jam is still hot, and seal them immediately to keep it nice and clean inside. On the other hand, if you just want to put them in the fridge for a while and will eat them sooner, then there is no need to sterilize. UPDATE: This jam turned out to be VERY sweet. You may want to adjust accordingly if you plan on just putting it directly into the fridge. Not sure how that will affect the canning process, since sugar helps to keep the jam fresh. Put 7 ounces of the strawberries into a preserving pan (I used a large, heavy-bottomed stockpot) with 1 cup of the plain granulated sugar. Crush to a pulp with a potato masher (I used a fork). Place the pan over gentle heat and, when the fruit mixture is warm, add the rest of the strawberries. Bring to a very gentle simmer, agitating the bottom of the pan with a wooden spoon to prevent the fruit from sticking. Simmer for 5 minutes to allow the strawberries to soften just a little. Remove from the heat and, if the surface is scummy, stir gently until the scum has dispersed. Put into sterilized jars. Use within 1 year.